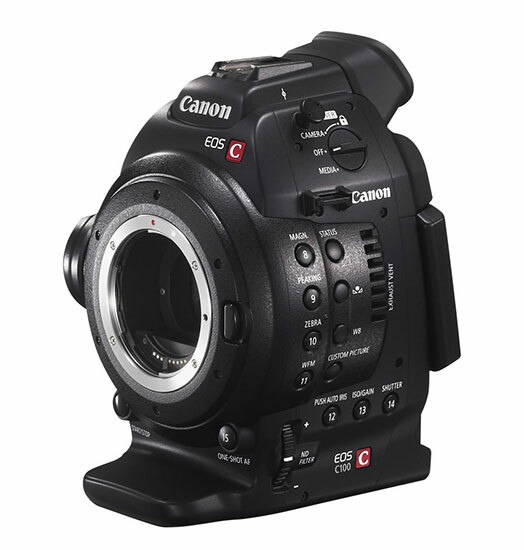 Apply for a Canon Cinema EOS C100 AF lease: 1.99% & 0% Interest Lease Program. Canon ITCG, in partnership with Canon Financial Services, Inc. is offering 1.99% financing for 36 months and 0% for 24 month leases. Dual Pixel CMOS AF Feature Upgrade: Includes upgrade for the EOS C100 Digital Video Camera that offers an autofocus mode to help ensure sharp focus and smooth focus transitions. The upgrade provides a new Continuous AF (Autofocus) Function for all autofocus Lenses, using Dual Pixel CMOS AF technology. A new AF Lock setting also lets you change the image framing while holding the desired focus. These critical focusing capabilities are designed to help reduce out of focus video while providing for smooth focus transitions and assist users when operating with small crews. The EOS C100 camera with Dual Pixel CMOS AF technology features a CMOS sensor that consists of an array of pixels that each feature two separate photodiodes. By continuously comparing their outputs during AF mode, phase-difference autofocus helps ensure non-blurred images and smooth focus transitions even when the talent and/or camera are moving. The new feature places a high priority on maintaining sharp focus while, providing a natural, smooth autofocus movement with select Canon EF lenses – including newer-generation STM lenses – which offer even smoother and quieter operation. 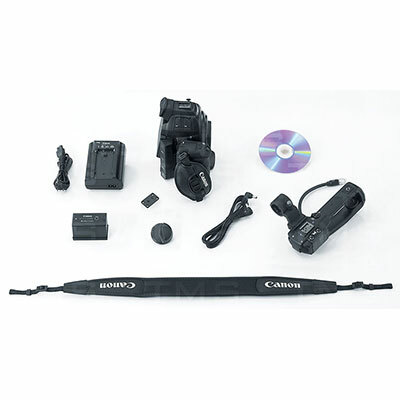 INCLUDES: EOS C100 Body with Dual Pixel CMOS AF Feature Upgrade, Grip, Camera Cover, Handle Unit, Thumb rest, Battery Pack BP-955, Compact Power Adapter CA-930, DC Cable for CA-930, Tripod Adapter Base TB-1, WFT Attachment, Measuring Hook, AC Cable x2, Shoulder Strap SS-1200, Data Import Utility Disk. With a rich Cinema EOS feature-set and optimized for one-person operation, the EOS C100 is a full 1920 x 1080 digital video camera thats compatible with Canons entire range of EF Cinema and EF-lenses. 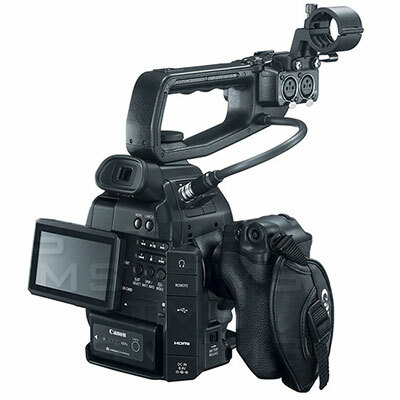 Equipped with the same Super 35mm Canon 8.3 Megapixel CMOS image sensor and revolutionary Canon DIGIC DV III processor as the EOS C300 and EOS C500 series cameras, the C100 is a more compact professional camera thats highly mobile and ideal for those seeking operational convenience and exceptional HD imagery. Recording AVCHD format video to dual SD cards, the C100 is compatible with a wide range of workflows and can acquire content to suit a broad range of post production/color-grading preferences, including Canon Log Gamma and a new Canon Wide DR Gamma. Autofocus recording with supported AF lenses, a multi-angle control/LCD panel, a removable handle and rotating grip, and many other innovations provide compelling mass-market appeal. The EOS C100 is equipped with the advanced 16:9 Super 35mm Canon CMOS sensor. The large sensor format opens up cinematic vistas and permits a shallow depth-of-field for arresting images. The 8.3 megapixel sensor and its fine pixel pitch permit greater sensitivity in low light while minimizing noise. The EOS C100 captures Red, Green, and Blue channels independently for Full HD 1920x1080 video. The resulting picture features the color and image quality of a three-chip camera with a single sensor. The optimized pixel count allows the camera to avoid additive processing as a result of skipping lines during capture; sensor sensitivity is maintained and aliasing or other degradation of the image is prevented. This function provides assistance in determining the exposure. It automatically adjusts the aperture in accordance with the brightness during recording. PUSH AUTO IRIS function is activated only while PUSH AUTO IRIS button is being pressed for manual aperture adjustment.